Lonely Planet kayaked with Ilene in Alaska and loved it! The entire trip was a fantastic adventure. Each day showed us a different side of Glacier Island – for stormy seas to beautiful sunny days and Ilene keep us safe, happy, and definitely well fed the whole time. For those of us who maybe live a little far from Alaska’s raw beauty, this is an rare opportunity to experience a new and exciting landscape. From the glacier calving, to Orca watching, to following seals as they dip and dive through growlers, the trip was truly unique. This was my husband and my second trip with Anadyr. Last summer we did a 3 day camping trip to Shoup Glacier and Sawmill Bay. It was so amazing that we knew we needed to return. This year we worked with the same guide Ilene to plan an epic 9 day remote kayaking trip from Meares Glacier to Columbia Glacier. Ilene was phenomenal from the start. We coordinated back forth discussing itinerary plans and the trip specifics so it was exactly what we were looking for. The weather was amazing for the first three days around Meares. Ilene’s experience and knowledge was invaluable. Unfortunately the weather turned for the middle of the trip. Nonetheless Ilene made it fun, playing games and keeping us as warm and dry as possible. During the rougher weather, we got our resupply from Scott. With the high winds it wasn’t safe conditions to round the point on our itinerary. He gave us a lift to push past there so we could get back on track the next day. Thankfully the weather turned back to beautiful. That day we paddled to the face of Columbia Glacier. The view is probably the most beautiful thing I have ever seen. The trips that Anadyr offers are honestly once in a lifetime opportunities. Their guides are so knowledgeable and personable. We are so thankful for Anadyr for such an amazing experience. I would highly recommend them to anyone who wants a truly amazing experience. I had the pleasure to work with Ilene and Leigh for their 2018 Yoga and Sea Kayak Retreat. Their group of happy travelers stayed at our Retreat Center – Istmo Yoga and Adventure Retreat – for the three nights of the Pacific Ocean part of the retreat. Leading up to the retreat, both Ilene and Leigh worked with me to ensure that their retreat participants would have a flawless experience, checking in with me are arranging all the details. I could tell that they were very committed to making sure their retreat participants would have an amazing experience, one where they felt taken care of and happy. When Ilene, Leigh, and their lovely group of travelers got here, I was impressed with the personalized attention they provided to each retreat participant. They made sure each participants food requirements were conveyed and made sure we had lined up the perfect personalized activities for the group member. What I loved the most about the group was the family feeling, after each meal they would sit on at the dining table and tell stories, play cards and just enjoy each others company. We could not help but join in and enjoy their company too! Besides their attention to detail with the retreat participants, and their personalized service to each group member, I was also very impressed with the post-yoga-glow each member had after their yoga classes with Leigh. I wish I had made the time to take one of her classes, but I could tell that the group member got a great deal out of each class. I can only hope that Ilene and Leigh repeat this same trip 2 or more times per year, as I would love them to be back here! And if you are considering signing up for one of their retreats, don’t think twice – it is a lovely experience, and you will be happy you did! Our family spent four days and three nights on a sea kayak adventure of a lifetime! We were guided by the one-and-only Ilene! There are too many highlights to mention them all…the views, the wildlife, the water, the wondrous smallness of our selves in the immenseness of the sea and wilderness of Columbia Bay and Glacier Island. I felt that our family was completely safe in the trusted hands of Ilene and the Anadyr crew. We began our trip as sea kayak novices and ended the trip ready to book the next trip! I rocked up in Valdez with my husband, a 3,000 mile motorbike ride from home, ready to embark on five days kayaking. We showed up for the briefing at Anadyr the evening before departure a little apprehensive – we had SO many questions. Will there be coffee?, how many layers will I really need? Can you really get enough gear onto a couple of kayaks…? Our guide Ilene showed up and started explaining the plan for the trip. After around 2 mins my husband leaned over to me and whispered: “ I think we’re going to be just fine….”. Ilene was AMAZING starting with the briefing – she made sure we had everything that we needed – and made suggestions where the camping gear we had was a better option than the ones provided (we had camp chairs with seat backs and really great bed rolls), she had us trying on all the waterproofs (take everything they offer you) and woolly hats. She even had us standing with our rubber boots in a bucket of water to make sure that there were no leaks. We were given the full briefing – of what to expect, where we planned to stop – any contingencies for weather etc. The trip itself was incredible – it is such a privilege to see the beautiful Prince William Sound and Columbia basin from a kayak. Camping in the wilderness was an amazing experience – my favourite camp spot was just opposite one of the tongues of the Columbia Glacier.And having such a brilliant guide helped. First of Ilene is incredibly competent – you know that she’s totally on top of all the tides and weather in the region. This is not someone who is going to forget something and she knows more knots than a boy scout. She’s also infectiously enthusiastic about expedition kayaking and the Prince William Sound – she’s found what she loves to do and she enjoys sharing that with people. She does this every day and yet she was just as excited as we were at finding some particularly attractive icebergs. Luckily for us, something else that she loves is planning and preparing meals on trips. That worked well for us as we love to eat 😉 Somehow she managed to conjure up a series of pretty impressive meals using only the most basic equipment. But above all she’s great company. We had plenty of time both on the water and in the campsites to chat. We laughed a LOT. This was an incredible trip in an absolutely stunning part of the world – you don’t get much closer to nature than this. Go and kayak here – and ask for Ilene. You won’t be disappointed. A friend recommended my husband and I to Anadyr and we cannot say enough excellent things about our experience. We are experienced backpackers but had minimal kayaking experience so needed a seasoned guide to help us on our adventure. We were fortunate enough to have Ilene with Anadyr. She was immediately friendly and welcoming. Her knowledge and expertise was quickly evident. We were so grateful for her fun personality and vast knowledge about local wildlife in addition to kayaking. We had decided to relax a bit on this trip so took advantage of the guide led option which included our guide cooking for us. Ilene spoiled us! The meals she prepared were absolutely amazing and very delicious. She kept us entertained with fun facts about our scenery and the wildlife we passed as we paddled throughout the day. Setting up camp at night, it was so fun to relax and enjoy the natural beauty of the area and great company. Shoup Glacier was stunning. With how it had melted we were able to climb right up to the face of an enormous ice cave with a waterfall inside. The next day at Sawmill Bay was peaceful and beautiful as well. The numerous waterfalls along our trip and the variety of wildlife including seals and otters were amazing to see. Overall, Ilene was amazing and we would definitely consider another trip with her. The area is beautiful and if you have a short timeline, the Shoup Glacier and Sawmill Bay trip was excellent. My trip to Guna Yala, Panama was one of the most incredible trips of my life. This was in large part due to Ilene’s wonderful skills as a kayak trip guide. I had never sea kayaked before and was nervous to head out in the open waters. Ilene knew just what I needed to feel calm and supported as we set out on our first day. She was always available and happy to help me feel comfortable and safe kayaking and camping on the islands. She was very flexible to the changing needs of the group as the trip progressed and was totally willing to change the detailed itinerary she had planned depending on the desires of the group and the changing weather conditions. Ilene led us through some of the most beautiful coastal wildlife and landscapes I have ever seen in my life. The Guna Yala islands are home to flying fish, giant sting rays, star fish, crabs, lobster, and tons of different varieties of fish and birds. Ilene knew just where to go to see all of it. We kayaked through aquamarine seas and snorkeled in crystal clear warm Caribbean waters. We lounged in hammocks on white sand beach islands and lived in paradise for 8 days. I was blown away at the deep relationships Ilene had developed with the local indigenous Guna peoples. We didn’t go anywhere without our Guna guide, Nemesio, who translated for us and became a good friend. This allowed us to engage with parts of the Guna culture that most tourists don’t have access to. Ilene opened up worlds for us inside the indigenous Guna culture. We went fishing with local Guna fisherman; we learned traditional dance and song with communities; we took cooking classes in the traditional dishes of the Guna peoples; and learned about traditional crafts from elders in the community. We ate like kings during our trip with fresh seafood that had been caught that day and tropical fruit. Words can’t express how grateful I am for the opportunity to have taken this trip of a lifetime in Guna Yala, Panama. Thank you Ilene for taking me on the most beautiful vacation of my life! Ilene was our lead sea kayak guide for a 4 day trip for a group of 11 people into the Guna Yala Comarca in Panama. As a kayak guide myself, I watch pretty closely to see that other guides address skills, safety, conditions, and other considerations fully. In my opinion, Ilene excelled in all aspects of our trip. She held great skill review sessions for our mixed skill group, and did a great job at assessing and communicating safety considerations. She also was the most personable kayaking guide I’ve encountered, and all members of our group gave her the highest marks. She also is obviously passionate about sea kayaking herself, and that enthusiasm was infectious among our group. Having done a trip with her in Panama, we’re now working on a trip with her in Alaska! Sippin’ on cocos, no big deal! I went on this trip on a whim because I wanted to experience sea kayaking and the pictures on Ilene’s website looked so beautiful. As it turned out, I ended up being the only person to go because some guests cancelled last minute. I felt a bit nervous at the thought of going to Kuna Yala alone with only Ilene as a guide and Nemesio and Orais to help out because I didn’t want to draw too much attention to myself, but as it turned out, the trip was awesome! First of all, Ilene is super friendly and chilled out and totally put me at ease from the moment she picked me up at my hotel in Panama City. She’s very passionate and knowledgeable about the Kuna culture and has a great rapport with the Kuna community, which is really reflected in the quality of the tour. I thought my 5 days in Kuna Yala was a perfect first introduction to the Kuna culture and their way of life and has made me want to learn more. Ilene was also really sensitive to my needs so I was able to find a good balance between chilling out in my hammock and getting a little more sweaty in the sea kayak or on the yoga mat. Kuna Yala is very beautiful and Ilene showed me some of her favourit spots which were truly spectacular! It really felt like I was in Paradise-a feeling that was heightened by the amazing food cooked by Orais and by the friendly Kuna people, including Nemesio and all the families that we stayed with. I think the best part of the trip was the friendships that I made and I can’t wait to go back! We went on a five day kayaking expedition with Ilene in the Guna Yala. We’ve been on several kayaking expeditions, and this was by far the best: Ilene is a fantastic guide — exceedingly skilled, competent, experienced, attentive, accommodating, and positive — and the Guna Yala has a unique mix of incredible nature and culture — coral reefs, unspoiled tropical islets, pristine water, and the Guna. Kayaking with Ilene and visiting the Guna Yala gets my highest recommendation: you would be hard-pressed to find a better guide and place to visit. 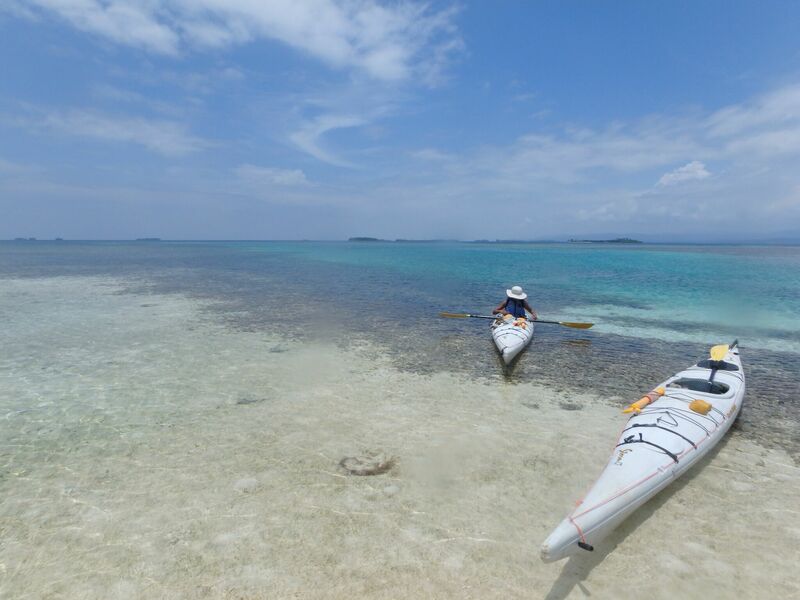 Our trip to Guna Yala was truly a lifetime experience, mostly due to the opportunity to immerse ourselves in the area by sea-kayaking and island hopping. Ilene’s facilitation throughout was exceptional. Competent in all things sea kayaking and she’s so much fun! Her trusting relationship with our Guna hosts bridged the expected gap and allowed for the trip to be culturally immersive as well! Ilene allowed us to take on the trip ourselves in many ways, constantly communicating in a way in which we had input into what came next. Having some autonomy is something that has kept me away from guided trips in the past. but was really a non issue with Ilene and her crew. It felt like being out with friends, and left me wanting to join in another trip soon! Three friends and I joined Ilene for an incredible adventure through Prince William Sound, Alaska in late June 2016 (5-day kayaking tour around Glacier Island and Columbia Glacier)! It far exceeded our expectations for a rugged, physical and natural existence for several days. While being out of our comfort zone, I never doubted Ilene’s leadership and always appreciated her warm and friendly disposition, engaging our curiosities about the Alaskan land and lifestyle. I was impressed with her depth of knowledge of and passion for the wildlife, plant life and our environment. The Anadyr tour was well organized with diverse scenery and we were truly humbled by nature during our paddling adventure. We only experienced one day with partial rain and were lucky enough to see humpback whales, harbor seals, sea lions, sea otters, bald eagles and an entire colony of puffins! Our camp sites were all adequate with one of them allowing for a short hike up to a waterfall, and the equipment was in very good condition. We ate surprisingly well at sea, with Anadyr soliciting food requests in advance, and we even had French-pressed coffee every morning 😉 I have already recommended Anadyr and this trip with Ilene to several friends and will continue to do so! My husband and I, along with two friends, did a 5-day Glacier Island and Columbia Glacier tour. It was truly the experience of a lifetime. None of us had ever taken a trip of this kind. For my part, it was essentially the first time I had ever been in a kayak, and one of the first times I’d been camping. I can’t say enough about what a joyous experience it was to be out in vastness and beauty of Prince William Sound – and to do so in such a cool and memorable way – to see all kinds of wildlife, and to discover a new activity that my husband and I love to do together. Ilene Price was our guide, and I can’t say enough about what a joy it was to have her leading us on this journey. She was on top of every detail (including my very serious nut allergy – her food was AWESOME, by the way! ), always made us feel safe and comfortable, and was just a delight to be with as we exchanged stories and laughs while paddling through this STUNNING part of the country. I can’t say enough about the Anadyr kayaking experience. Cast aside any doubts or fears, and take this unforgettable trip! My husband and I did the 7 day Glacier Island trip. Neither of us have done anything like this before and I was incredibly nervous to be camping and kayaking. Our guide, Ilene, was amazing. She tailored our trip to us and made the most delicious meals. I actually gained weight despite kayaking all over the ocean. She was incredibly knowledgeable of the local wildlife and showed us things we would never have known to look for. We saw so many amazing sights- whales, sea otters, seals, too many seabirds to count, bald eagles, sea lions, river otter, deer, sea stars and jellyfish. We even saw a bear. Ilene made sure we always knew what the plan was and let us decide how to spend our day when there were multiple options. When our camera died on the second day- she took pictures and shared them with us. We kayaked in all sorts of different conditions and saw the landscape in a very up close and unique way. I can’t imagine a better way to explore Alaska and I would do a guided trip with Ilene again in a heartbeat. We did a 3 day, 2 night trip with Anadyr in early May – first camping trip of the year for them. We spent a day at Sawmill Bay and a day at Shoup Glacier. The solitude, beauty, and wildlife we encountered were absolutely astounding. Our tour guide (Ilene!) was amazing – great information about the local wildlife, showed us some fun hikes to go on from shore, and we even had some fun foraging for edible plants, berries and mussels. Wildlife highlights: sea stars, sea otters, sea lions, seals, porpoises, a porcupine, 20 different kinds of waterfowl and about 90 minutes following a humpback whale along the shoreline!!! Just completed great 4-day camping trip with our guide, Ilene. Anadyr’s small group size allowed her to provide a customized trip to based on our interests. She included stops so we could photograph wildlife & scenic views while learning interesting facts. The beaches chosen to camp on had magnificent views. Hikes along with exploration of an old mine were also included. From the kayaks we viewed humpback whales, seal lions, harbor seals, sea otters, & eagles. Ilene even packed guide books so we could look up different birds seen throughout the day. At night we dined on delicious dishes custom cooked for us, she even bought cheesecake! Anadyr packing list was very helpful, good gear provided, and great humor along the way. Prince William Sound is a must if you wanna experience Alaska. Me and a friend did the Meares to Columbia kayaking trip which took us deep into the fjords of Prince William Sound. The scenery is absolutely amazing, the forest makes you feel like you’re in a fairytale, the kayak gets you close to wildlife and the tidewater glaciers are huge. Beside being a great guide, Ilene is the best outdoor chef I ever met. I would says I’m a quite avid outdoor cook but i usually still lose weight due to the workload on trips like this. I’m pretty sure I added a few pounds due to the delicious food. Furthermore, Anadyr really went all in to make our trip great. Due to bad weather and wind, we were held up a day but they came out with their boat and bumped us closer to Columbia Glacier so that we could have a full day there as planned. This was our second paddling adventure with Anadyr. Last year my wife and I did day trips to Columbia and Valdez Glaciers, which were amazing. This year we decided to spring for an overnight lodge-based trip. While the trips may seem somewhat expensive, you really have to understand how much you get for your money. This is a long-established professional company with the equipment, contacts and guides to go with it. They provide everything you need, from boots to overalls to rain jackets. They have a huge inventory of all these items as well as the well-maintained kayaks and PFD’s. And their location is right there on the beautiful Valdez small boat harbor. For most glacier trips, water “taxis” are used to get you to appropriate starting points in Prince Wiliam Sound and pick you up (and fuel isn’t cheap). The guides are highly-trained professional employees who make sure all the gear fits you properly, that you paddle safely, and that you have fun. They are very good with all kinds of kayakers, from first-timers to experienced, kids to seniors. And there are trips for everyone- shorter day trips, longer day trips, overnight tent camping trips, cabin camping trips and lodge-based trips. For the second year in a row Ilene was our guide. She is experienced, caring, informative, funny, and passionate about the beauty of Prince Williams Sound, its glaciers, birds and sea creatures. Staying at the lodge in Ellamar was an incredible experience. Chris, the entertaining owner, prepared truly gourmet meals. In addition to paddling and hiking, we had so much fun running from the woodburning sauna into chilly Prince William Sound and back to the sauna. Ileneserenaded us at night, accompanying herself on mandolin as we watched frolicking sea otters right in front of the house. What a thrill when a sea lion popped up right behind our kayaks! On the trip back to Valdez the water taxi driver stopped so we could enjoy watching humpback whales surfacing with glaciers in the background. My wife and I heartily recommend Anadyr Adventures for an up close and personal experience you cannot get from a cruise ship or tour boat. Valdez is accessible by road, ferry or plane and is worth the trip.
. . . Our guide was Ilene, very nice girl, I can say she was the best guide we had all around Alaska. Funny, talkative, friendly. She instructed us with all safety procedures. . . she was checking all interesting places first so we can safely follow her. We got some history lessons about glacier and its huge impact on Valdez developing area. Also about earthquake. . . Trip was fantastic, paddling was quite easy as we had no wind. . .
. . . Ilene was our guide, she was very patient and very experienced. Close contact with the iceberg, unforgettable. We also wanted to put in an extra good word for Ilene and Nemesio. They are phenomenal guides and they were extraordinarily helpful, knowledgeable, and accommodating on the trip – we give them our highest recommendations. Ilene is perfectly suited to this role. She is such a “yes” person and helped us have the exact trip we desire.
. . . Ilene was our guide and though we did not have prior experience in kayaking, she was very friendly and always smiling to guide us. . .
. . . So beautiful. Ilene was our guide on the Columbia Glacier trip. She was very knowledgeable and kept us in safe areas. We saw icebergs, which started floating when the tide rose. That was really neat! We saw wildlife and had lunch on one of the islands. The glacier was beautiful and we got to hear the thunderous sounds from the calving. We got super close to a see otter who was resting on an ice chunk. Loved it and highly recommend this company. . . The area around Columbia Glacier was beautiful. We kayaked around several icebergs and even a few sea otters. I think the best part of our trip was how awesome our guide, Ilene was. She knew so much about the area, from the glacier recession, the birds of the area, nomenclature of icebergs, and even tidbits on the Exxon-Valdez spill. We spent a week in Alaska and this day trip was definitely a highlight of our trip. Highly recommended!
. . . Thank you for the experience of a lifetime esp to Ilene. . .